Florida-based Pelican Water Systems launches a dual, compact water filtration system for the treatment of chlorine and chloramine. The systems are designed to purify and soften water in small homes, apartments, and condos. A respected leader in the at home water filtration industry, Pelican Water Systems is pleased to announce their innovative EZ Connect Compact Water Filtration Systems. These compact systems, the first of their kind in the U.S., have been designed specifically with the urban home in mind. 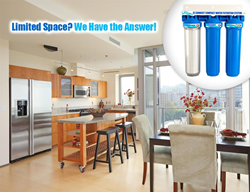 Both systems are space-efficient and offer ease of installation that, when paired with their compact design, make them ideal for a myriad of users including those looking for water filtration systems in boats and RVs as well as apartments, condos, and small homes. In addition, the systems boast DVGW certifications and waste no water or electricity, as no drains are used in the purification process. Benefits of purified water extend not only to consumption, but also to cooking, cleaning, and bathing. Homes with treated water offer cleaner tasting water, better quality of cooked foods, and showering experiences that leave homeowners with softer skin and hair. Pelican Water is excited to offer these products at competitive prices starting at just $199 for the dual filter and $799 for the combination filtration set. Replacement filters are also offered direct from Pelican Water Systems for the longevity of these systems. The filters will also be available as part of Pelican’s Water Shield program. PelicanWater.com is the official, factory-direct retail website for Pelican Water Systems, providing professional knowledge and leading technologies in whole house water filtration, countertop water filtration systems, UV bacteria disinfection systems, as well as salt-free water softening and conditioning systems. Pelican Water products use cutting-edge technology and enable customers to go green by eliminating wasteful and harmful salt brine discharge that is polluting our valuable fresh water resources. Pelican Water is also proud to offer under-counter reverse osmosis systems that are small enough for practical use in RVs and marine vessels. For over a decade, Pelican Water has stayed true to their mission statement: being a company that helps families enjoy cleaner, safer, better-tasting water in their homes in an environmentally friendly way. Pelican Water has been and continues to be the global market leader in salt-free water softening systems. For more information about Pelican Water Systems, visit PelicanWater.com.